thanks again, it's been a long time since i've felt this inspired about, well... anything. it's a good feeling. If the Tie Pilot was loud and pointed to himself a lot it was MOST definatley BILL! Cool - this must have been after the Star Wars Independent Film Festival. 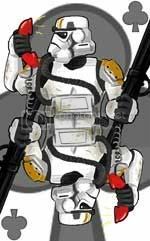 "The EVO troopers were one of the Empire's most specialized stormtroopers." Oh yeah... without a doubt, that is me!!! Yes, that was the Fanfilm festival. We were trooping TFAW after the Fanfilm festival was over with. And yes, boys and girls, it was all about me! that was going on at the same time as the H.P. Lovecraft film festival. had i known that there was a sw fanfilmfest going on that day, i would have ducked out of the horror movies to show some star wars love. Lovecraft was after our gig..... We had the use of the theatre until something like 1pm. The Lovecraft people were griping at us to get out of the dressing rooms... or rather they were griping that we were still there. We had the use of the facilities until 1pm and were out by 12:45??? Yeah, those Lovecraft folks were jerks! i thought you guys were the shiz! Yes... yes, we are. And then some! Just remember my friend, it is all about me...errrr, I mean us! It's late... you're getting doppier than usual... GO TO BED SCHMOE!! Yeah yeah.... it was rather late wasn't it?? ?